Did you know that over 100 years ago the first female physician in Italy laid the groundwork for what most preschool kids do in their classrooms today? 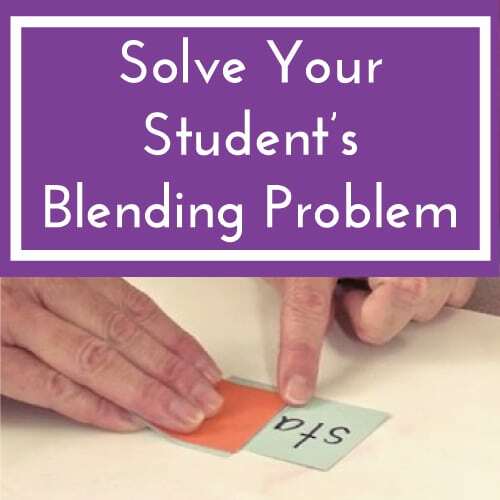 Hands-on manipulatives? Yep! Small furniture for little bodies? Yep! A keen eye on development? Yep! 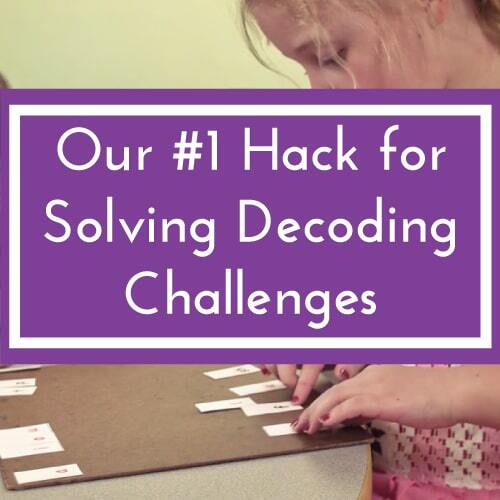 These ideas and more can be traced to Dr. Maria Montessori, yet, unfortunately, many of her other great ideas have been forgotten or ignored over the years. This is a great shame because her original insights have--since her days--been verified more and more by research (example 1, example 2). 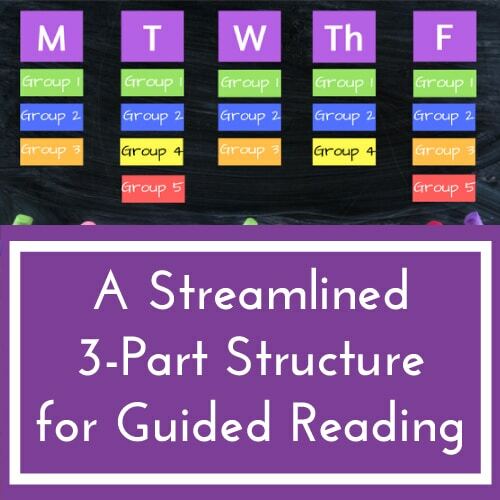 In this blog post (and video below), I explore how the Montessori method of early reading works and share the three initial simple steps Montessori put in place to lead young kids to become readers. 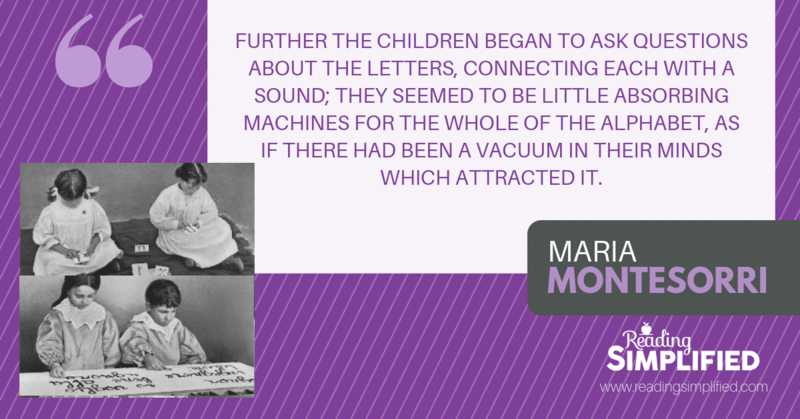 Maria Montessori was born in Italy on August 31st, 1870. She was Italy’s first female physician, challenging gender barriers at a time when women were often forced to take a back seat. Even her own father didn't want her to become a physician! Her method of education is firmly based on hands-on learning, self-directed activity, collaborative work, and a well-prepared teacher/directress. 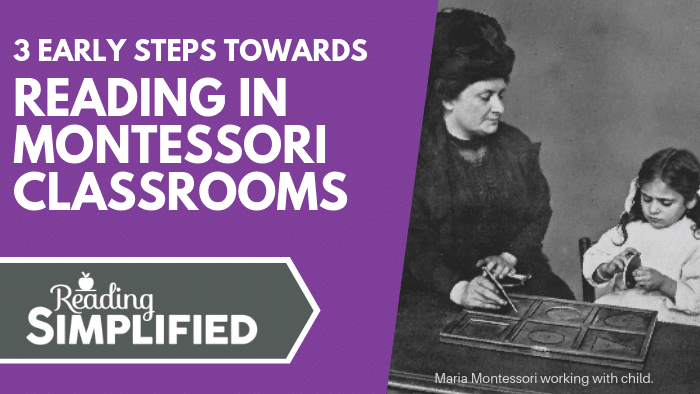 Montessori continued to adapt her methods over the years because she was a researcher at heart and was passionate about helping kids develop to their potential. Her work supports the theory that children can learn at their own pace--through their own experiences. In most Montessori classrooms, students are encouraged to make choices about their day's work. They select activities appropriate to their interests and development to learn about the world through all their senses. 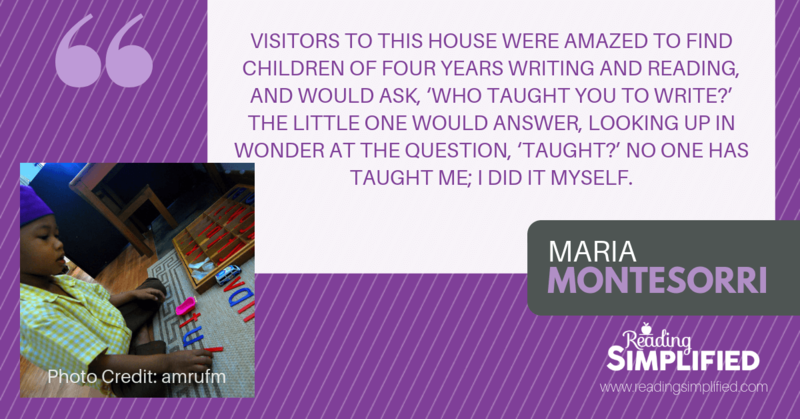 Montessori classrooms are a sight to behold. When you walk into a the classroom, you’re likely to see groups of children and individuals who are very focused on their activities. Their fine motor skills are acute because they’re manipulating objects in a variety of forms. Children carefully put materials back on the tray. They help one another. And the attention span of 2 and 3 year-olds in this environment seems almost unbelievable to me. When the child is ready, the first step is to tune kids’ perception into individual sounds (aka "phoneme awareness"--long before the term was even coined!). One of the first lessons often used today encourages children to listen to the beginning sounds of words. A great way to do this is with help from a classic game of "I Spy." The children would look at the objects, and if there were a cup, a hat, and a mitten laid out in front of them, they would pick up the mitten to correspond with the ‘mmm’ sound. As the child progressed, the objects would transition to things in the environment--spying something on the shelves right in front of them or later something anywhere in the room. In the early stages, the teacher starts with beginning sounds. Then, she moves onto ending sounds and then middle sounds in short words. 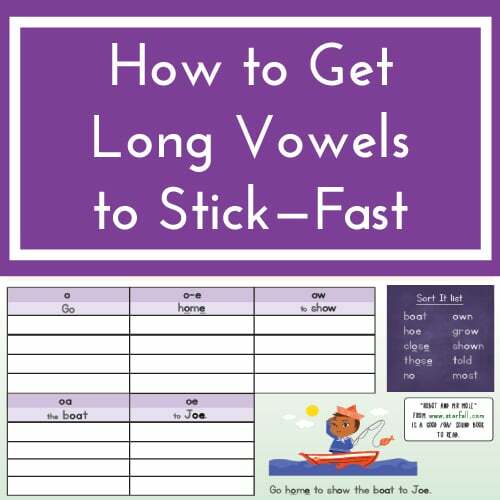 This simply oral game for 2, 3, and 4 year-olds helps to develop phonemic awareness and to pave the way for the alphabetic principle. 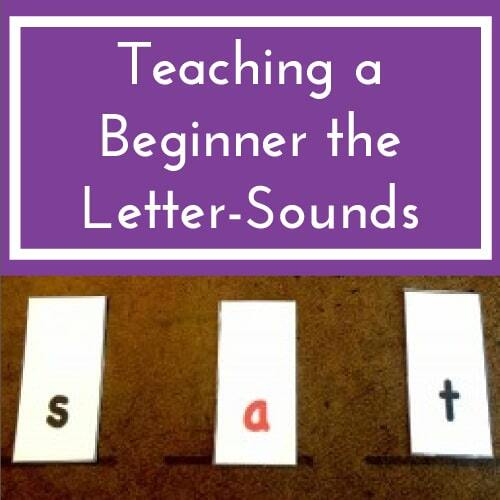 The second step is teaching kid’s the letter-sounds first, not the letter names! Again, kids use objects and cut-out letters and use them to match the sounds with the objects. Doing this helps them to associate sounds like ‘mmm’ with the letter-symbol (m) while using the object to bring in a fun element to the lesson. Students also run their fingers along sandpaper letters so they have a multisensory connection to the sound and symbol. Admittedly, research has revealed that letter names are highly correlated with early reading achievement (see Adams, for instance). However, I believe this pattern of findings has led to some confusion about what’s possible versus what’s bound by a contemporary cultural phenomena. Our home environments and education culture almost universally teach children letter names first. SO, those who learn that information are likely well-prepared and quick learners. As a result, they do well on later measures of reading achievement. However, what if the culture did NOT begin with letter names, but with letter sounds? In other words, the correlational finding between letter name recognition and early reading achievement could easily be swapped for letter sounds, were the culture to change. And such a change would make for sense for learning how to decode...make more sense about how letters relate to sounds. The final step in the early path towards reading in Montessori classroom is teaching reading through spelling activities. 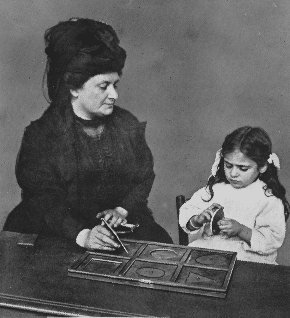 Montessori used an activity called the Movable Alphabet to unlock the alphabetic principle, decoding, and spelling for children. The Movable Alphabet begins with an compartmentalized box of the 26 letters of the alphabet, using 2 different colors to help early readers differentiate between vowels and consonants. When the child is deemed ready--not by age but by preparedness with at least the above 2 steps--the Montessori teacher invites the child to build simple CVC words, such as "sat" or "map." The student must perceive each sound in the word, select the correct letter from the box, and lay it out in order of the sounds in the words. 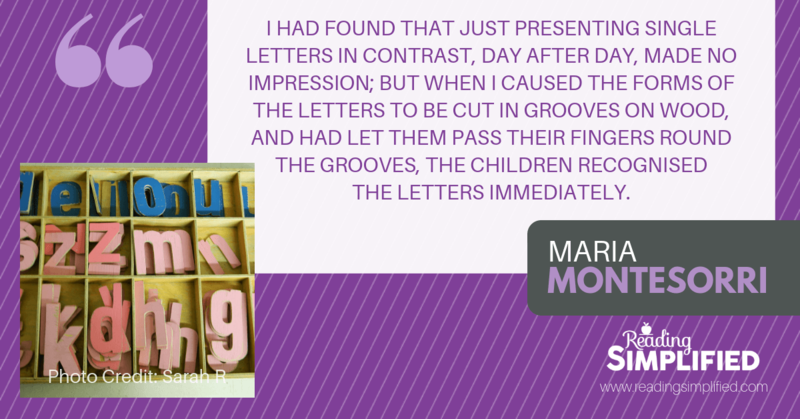 In other words, the child begins spelling--perhaps not even realizing what she can already do! We use a version of the Movable Alphabet here at Reading Simplified called Build It. 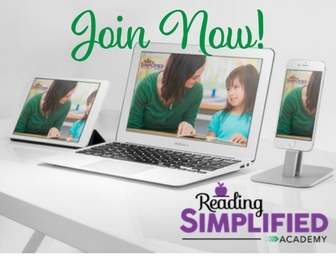 Build It is designed to integrate reading skills such as phonemic awareness, letter-sound knowledge, the concept of the alphabetic principle, early decoding, and spelling into one instructional activity. Learn more about Build It here. FREE Build It Letter-Sound Cards! If you want to get your hands on a selection of FREE letter-sound cards that you can use for Build It (and Switch It), leave your name and email address below and you’ll receive a free PDF of letter-sound cards to print from the get-go! What do you think of the Montessori education methods? Do you use her teachings in your classroom? Let me know in the comments! Wow, what an interesting article! I know a little about her work, but have not researched her. After this, I wish I would have. I do believe in using manipulatives & have used your “Switch It” game. Cindy, thanks for sharing this! 🙂 She was a remarkable lady! So glad you’ve found Switch It, too! I have used her ideas. She understands children better than anyone and so ahead of her time. I love your informative articles! I would like a set of free letter sound cards if still available. Thank you for sharing your research and all your wonderful strategies! Wonderful, Lynnette!! That’s great to hear. 🙂 You can find the letter-sound card here.